It's both. The bed of lump is the heat source during the initial firing of the cooker, something has to get the wood to burn and keep it burning cleanly. As the wood burns, it burns down into, essentially, lump charcoal. So the bed of coals consists of either lump charcoal (at the beginning of the cook, or added if needed during the cook), or the remanants from the wood as it burns down. Also, as I said, if the bed of coals gets too small, adding unlit lump to it will rebuild that bed of coals as it ignites. Use unlit lump if you need to at this stage, because if you add lit lump after the fire has been going for hours and the cooker temp and steel is equalized, that hot lump will give you a big temperature spike. You bet. Glad it helped. Ok….I removed the heat plate and the temp went up to 325 degrees. I put 2 briskets in but the one closest to the stick box really cooked fast. I decided that sliding the heat management plate about 1 inch away from the box might help regulate the heat. I'll report back after the next smoking session. Would you use one or two chimneys in the Cheyenne? I am hoping to get a Cheyenne this Spring. I would just use one for a Cheyenne. You could also get by with just one in a Wichita too. I used a Kingman in that video so it needed the extra charcoal. I was hoping you could give us some tips on how to use the gas ignitor for the wood box? Smoke, ask Kirby said 1 is enough... In fact I found that loading it with 3/4 full of chimney worked best for me but it might vary depending on the wood you will use afterwards. I put chimney inside a firebox during initial ignition (just like in the video) and theres definitely not enough space to fit 2. I hope it helps. PaddockPassion wrote: I was hoping you could give us some tips on how to use the gas ignitor for the wood box? I personally have not used one. I prefer to stickburn old school. Sometimes I'll just take a bunch of splits from small to large and build the fire using only wood for the initial bed of coals, but that's if I have some time to spare and I'm in that mood. If I were to use the gas ignition, I would put unlit lump in the bottom in the same manner I added the lit charcoal and wait for it to start to light. Once it's igniting I'd add a wood split on top of the charcoal bed. Finally when the charcoal is burning well and on its own, which should only take a few minutes, turn off the gas and run the pit as shown. If anyone has a gas starter and has any other advice, please feel free to chime in. Oh, and don't use lighter fluid. We took delivery of our Loaded Wichita last week. We ran the test fire on Friday night and planned to cook ribs on Sunday. You talk about jacked up; I have not been this excited since my children were born. 1. We have the heat management plate, but the temperature varied by about 75 degrees from right to left. The left side of the box rarely got over 200 degrees. 2. We are not sure that we have the heat management plate in the correct place. 3. We followed the video, but could not produce clean smoke. Every time we added a new, pre-heated stick, we got thick, white smoke. We only got wispy smoke on a few, brief occasions. 4. There was smoke leakage from the left side of the cooker. 5. One of our guests described the ribs as tasting like a campfire. It was a rough start, but we are committed to figuring this out. Any thoughts on what went wrong; any suggestions for getting a different result? I'll offer my thoughts and what I would try next, Starcity. 1. The HMP will even out temps, but there will still be a hot spot on the firebox side. An even pit is good, but I like when a pit has somewhat of a hot and cool spot. You can use that to your advantage if something needs to speed up, or slow down. Also if you are cooking different types of meat and need a hot spot for chicken and a cool spot for a larger cut. The HMP will take the direct heat away from the firebox opening, but it will still run hotter than the stack side. Once you learn how to keep the fire burning cleanly (see tips below), you can close the stack damper up to 1/3 of the way to keep some heat in that side of the cook chamber to even out the temps some. 2. Do you have a picture you can post? 3. Is the wood well seasoned? If the wood is still green or wet from rain it can be a difficult if not impossbile to get complete combustion and a clean burning fire. Oak can take 2-3 years to season properly. The clean smoke likely came near the time you needed to refuel I'm guessing? Since you are cooking on a Wichita (I did this video on a Kingman with a square firebox that is much larger) try just one chimney of charcoal to start and one wood split at a time. I think your fire may be too big and you have to choke it down. Since you said the intake was almost closed, you weren't getting enough oxygen to the fire and it was not burning cleanly. 4. Smoke leakage will be normal from the cook chamber door. Is this what you meant? 5. Again, incomplete combustion and a dirty fire will make this result. I make it a rule to not invite guests over until I know how a pit works. I would get a few cooks under your belt, understand how the run the fire and get a good end result before you invite guests over. I know it's tempting because you have this new toy and want to show it off, but it's best that you understand the pit first. For now, I would not warm the wood split on the inside of the firebox, just on the top of the outside. If you aren't careful, that split you are warming can sometimes start to smolder (especially in a smaller firebox) and create thick, white smoke while not producing any heat. For now until you learn the fire, just warm the splits on the top of the firebox only. When you add the split to the fire, give it time to fully flame up before you close the door back up, then monitor the cooker for a few minutes after. Some white smoke after adding a warm split is still normal, so don't worry about that. It should clean up after a few minutes. If you have never had a stickburner before, they can take some time to figure out. I learned in a cheap model that was a real challenge, so you are at an advantage that you are cooking on a quality pit. However, you still need to work at it to learn the cooker and how to make a clean fire and make changes that work for your pit. Once you learn it and understand how the fire will behave, you will be off and running. The heat plate should be installed with the angled portion inside the firebox. You want to leave the chimney and the door dampers wide open in the beginning, to preheat the cooker, once you overshoot your desired cooking temperature, start to close the door damper, but not more than 50%. Let the fire stabilize for 15 or so minutes before making another change. With the correct sized fire, and the door damper at 50%, you should be close to 250 degrees in the chamber. You can affect the lower grate temperature by closing the stack dampener by 25% or so. This will slow the air movement down and create a more equal temperature profile top and bottom. Never run the stack more than 50% shut, if you close it too much you will generally have a smoldering fire and dirty smoke. You will see a slightly different heat profile in the pit once you begin to put meat on and effect the air flow. The normal behavior of the pit will be for the top shelf and bottom shelf to run within 15 degree top and bottom. You are going to experience more radiant heat on the lower right hand side and a warmer spot on the upper left. The lower radiant side will typically cook 20°-25° hotter than the air temperature being measured. The upper left corner of pit will cook 10°-15° hotter than the lower left grate. Because the air movement is slow and deliberate the small temperature difference will have little if any effect on the quality of the food. It sounds to me like you were choking the fire out the whole smoke by having the intake closed off too much during the smoke, hence the dirty smoke and bad tasting meat. I ran a Cheyenne for 2 years and now a Kingman for 1, and there's definately a learning curve to good fire management. 1) I think you put way too much fuel to start the cook off. In my Kingman, I use 1 chimney of lit lump, and then either 1 large split, or two smaller splits. I've learned that if I put 2 decent size split on the lit lump, once they establish a solid coal base, it spikes my temp to almost 300+. Once those start to turn into a good coal base, I'll check temps, put meat on, and then add one split as needed, usually every 45/60 mins. 2) I run my intake between 1/2 open and 1/4 open, depending on how the fire is going. If it's shut or even close to being shut, you're cutting the O2 flow off, and you're going to see your fire start to smolder and that nasty white smoke. 3) Even with the HMP, I still see 50-60 degree differences between right and left. I've seen the videos where both sides are close to even, but I think they have the models with the HMP and damper inside the cooking chamber, or they're using magic. As mentioned before, if you look at how your HMP fits in up under the lip by the fire box, there are open spots on either side, some have mentioned filling those up with heavy foil to force all the heat under the plate. I left mine alone because I've learned to use the hot/cooler spots to my advantage. Here's a pic I took from this last Saturday's cook, did 4 pork butts for a party. This a few hours into the cook, cruising along at around 275. You can see it doesn't take much to keep it up at that temp. The exhaust is wide open and the intake is around 1/2. Great info kcphilaflyer, and great picture. Thank you! Thanks for the ideas and the picture. I will try to post a picture of the placement of the HMP. I will use less fuel and have more air in the intake. I really appreciate everyone's feedback. Great tips,thanks every one,I really surprised to see so much cooking with charchol I thought it was all about the wood-You mentioned that you cooked around 280 degrees,so how long would you cook a 13 pound turkey? And do you wrap it in foil or put on pit open?If not in foil what keeps juices in,and keeps from drying out? In an offset, the charcoal is a starter for the bed of coals. With no bed of coals, you really have no fire. Only wood is fed after the fire is started with charcoal unless because the wood burning down will create new coals. However if that coal bed does get too small that it's hard to maintain a fire, then adding a little lit charcoal will have you back on your way. 13lb is right in the range I cook. Turkeys are done solely by temp. Once it's 175* in the thigh and 160* in the breast, it's done. I brine turkey so it won't dry out, even with leftovers for your turkey sandwich. The only time foil is used is when I rest it. The rest is very important to get a good final result. If I'm eating the bird at home, I'll cover it with foil on the cutting board and after 30 minutes I carve it. A lot of my birds have to make a 45 minute trip though (since I'm usually asked to bring the bird to a family event), so I will wrap it in foil and a towel then put in a warm cooler and then go. The drive acts as the resting time and I carve when I arrive with consistently good results. I also do like to spatchcock my birds, which allow them to cook a little quicker and more evenly. Plus it easier to carve. All you do is cut out the back bone and splay open (on turkeys I usually just break the ribs by pulling the bird open) season and cook. To keep juices for gravy, elevate the bird on a rack or two depending on its size and place a pan underneath. That way none of the airflow to the bird is obstructed and you can still collect juices for gravy. Yoder_Kirby wrote: Here is a quick, little video I made to show some basic fire management in a Yoder offset wood smoker. I'm sure I have forgotten a few things, so if you have any questions, don't be afraid to ask. Kudos to you if you can stay awake all the way through. The drinking game is take a shot every time I say "uh". Ok herb,4th time I have watched-never heard of lump charchol who has that? Wood I'm using is pieces of oak total bark-would that be smoke problem? Lump charcal is readily available almost anywhere, hardware stores, Wal-Mart, etc. 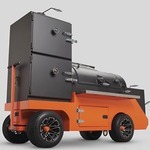 Ceramic grill brands like Kamado Joe, Big Green Egg, Primo, etc all have their own line of lump. So if there is a local dealer for those brands, they are likely to sell their charcoal as well. 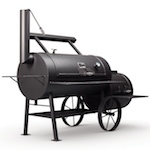 There are also independent lump charcoal brands like B&B, Royal Oak, Wicked Good, Fire King, etc. As far as your wood, if you are talking about branch pieces that are round with bark all the way around, they are harder to burn cleanly, especially oak. I leave bark on my wood that I burn, but if it's a branch piece, I will split it because they are harder to burn cleanly. If they are too small to split and use effectively, you can use them during start up while getting the heat up, or use them in a fire pit if you have one. Just to show diversity, I debark all the wood I burn. I do not like the brownish smoke that it produces, but this is just a personal choice. The wood needs to be dry, or "seasoned". This means that the water content in the wood needs to be below 25%, and ideally at 20%. 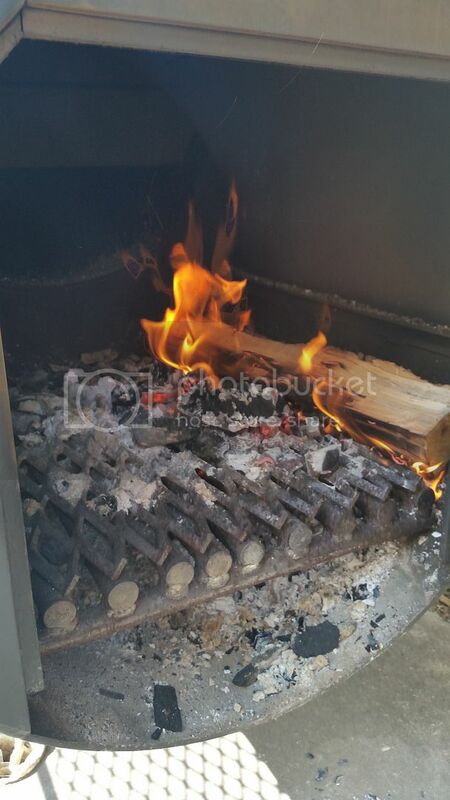 If the moisture content is higher, the wood will not burn efficiently, and produce much more white (dirty) smoke. Wet wood=less heat and more smoke. Here is a statement I found on the Internet: "The right band of firewood moisture is between 15 and 20%. When you get much over 20% you start to see symptoms of sluggish ignition and the inability to turn down the air without extinguishing the flames. Towards 30% the wood sizzles and fires are very sluggish and it is hard to get a clean burn until the wood is almost to the charcoal stage. Above 30% water bubbles from the end grain when the wood is heated and it is very hard to burn at all." When wood dries, normally, the first thing to happen is that the bark comes loose or falls off, it starts to crack and check, it feels lighter, and when struck against another piece of wood it will sound more hollow if dry and make more of a thud when wet. Do a search on the Internet for "digital moisture meter" if you would like to have a tester to tell you the moisture content of the wood you want to burn. To piggyback on Herb's statement, another way to describe the sound dry wood makes is like that of a (wood) baseball bat when it hits the ball. If you hit two pieces of wood together and it sounds like you are at a ball game, it should be good to go. If it doesn't have that trademark "crack", then it still needs time to season. Not sure what you mean by fully seasoned. If its really old wood it will not generate good coals. It will just turn to ash. I have a similar pit and I do add charcoal, about two handfulls at a time when needed and also about one stick of wood about every half hour. Dont put a big load of fresh charcoal on all at once. You're running a little hotter than me too, so the pit will be a little hungrier.